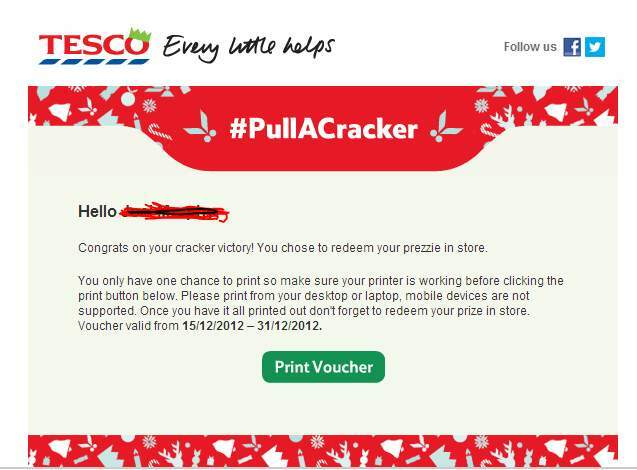 Tesco pull a cracker - Guaranteed prize (Lindt Chocolate or Kindle!) for you or your friend! Tesco are running a Christmas competition! You, or your friend are guaranteed to win a prize. All you have to do is tweet someone on Twitter with the hashtag '#PullACracker'. If they reply to you with the hashtag, you will win. @username will then have to reply to the tweet with "Yes I'd like to #PullACracker with you", or something along those lines. 1) You need a fully activated (via e-mail) Twitter account. 2) Search for a friend who is also fully activated and send him a small message (not required) with the hashtag #PullACracker in it. 3) The person then needs to reply back also with the same hashtag #PullACracker. 4) Once that is completed, go to "connect" and Tesco should hopefully have send you a link where you and your friend will be pulling a cracker for the prize. Simple. Please don't post your personal details in this thread or offer / invite tweets or ask members to contact you via PM in the thread as it breaches forum code of conduct guidelines on posts for personal gain. Share this with your friends not on a public forum please, thanks all and good luck. "I think if your twitter username is quite long they might not tweet you. Because they won't be able to fit all the text and the link in one tweet." Play against the same person twice then split the winnings! You only get 2 chances so this way makes sure you don't lose twice. How do you actually win then? So I've tweeted my hubby and he's tweeted back to me. Now what? What do i do now that i have sent that tweet? It looks like they generate a link manually, so some of you may have to wait a while for your link to be generated. Edit:It looks like they generate a link manually, so some of you may have … Edit:It looks like they generate a link manually, so some of you may have to wait a while for your link to be generated. I'm pretty sure it's automated. That's what I thought at first too. I have a bit of experience with creating Twitter apps though, and if you automated something via the Twitter API, it will say via "TescoTweets" or whatever in the tweet details. Won some Choco LOL. Woohoo! Thanks to whoever answered back. Sorry don't think I can reply to anyone else. Good luck everyone else. How long is it supposed to take to receive the link? Thanks guys, will be able to do it tomorrow. Won some chocolate, just waiting for the email. No worries mate! Sadly not I doubt there are many to be won tbh. Hiya sorry I'm on my phone and struggle with Twitter as it is lol... I take it I won then? Got to the cracker pulling page but scared of it eating my data... Is it email they contact me by? I can fw you the prize if you like? Thanks, Won both times. Got 2 Lindt bars. Ah man out of crackers . Got 1 bar ! Cheers ! Thank you for helping an old fart out! Oh god, feel such a ****! I have got the tesco bit up and it says to go and look at the link but I click on the link and nothing happens. Sorry, I do not use twitter so am completely clueless! Oh god, feel such a ****! I have got the tesco bit up and it says to go … Oh god, feel such a ****! I have got the tesco bit up and it says to go and look at the link but I click on the link and nothing happens. Sorry, I do not use twitter so am completely clueless! Just realised something - you need flash to pull a cracker, and Ipads don't support flash so you'll have to do this on your desktop.